Case Study: Can translations boost ad performance? Before we get into Audience Insights make sure you have read through the Finding Buyers section of the Training Center; it is extremely rare for a seller to be able to target buyers effectively only using Audience Insights – you need to make sure to do thorough niche research first! We’ll walk you through an example of how to use Audience Insights below. Don’t forget in order to access AI you may need to set your Facebook language to English US (through your FB account settings). In this example we’ll discuss targeting EU buyers who are passionate about camping. Keep in mind the ad type you select will determine the audience size you should aim for; we’ll cover this topic in more detail later on so make sure to read the entire “Getting started with Facebook ads” section before launching your first ad. 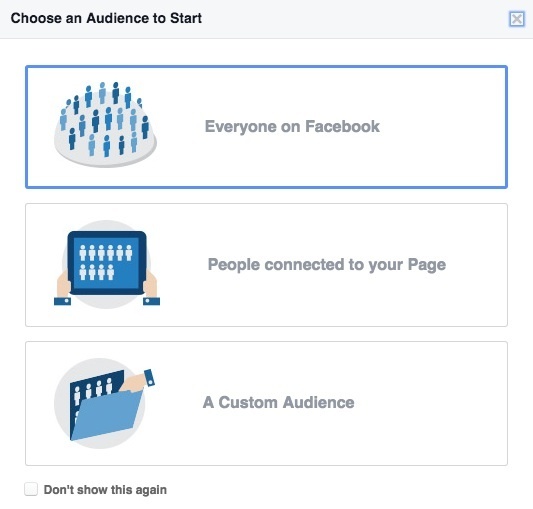 Go to Audience Insights and click “Everyone on Facebook”. Then, look to the left column with all our audience’s details. Remove “united states” as the selected location. You can select both men and women if the design is gender neutral. If the design is for men only keep in mind most purchases are made by women (they could be buying a gift for a man for example) so we usually recommend you always include women in the target audience. Under “Interests“ type the main interest that represents our niche: “camping”. On the right side of the page, let’s click on the “Location” tab and select “top countries” to see which countries have the highest amount of camping enthusiasts. We want to target buyers in Europe only, so let’s only include countries within the EU. France has a good amount of camping fans so let’s type that country in the left column under “Locations”. Our audience size (top of the page) is now over 3 million. That’s a bit too broad! Let’s continue to narrow it down. We need to focus on specifying the characteristics of our niche; you can narrow down your niche further by only targeting people with a certain relationship status, who speak certain languages, have just reported certain life events or between certain ages. For example, if your design is for moms who are proud of their baseball playing children, you can narrow down your audience to only target women with children using the parameters like ‘parental status’. Another example would be targeting people who speak a certain language, particularly if your design is not in English. Ok, now let’s look at “Page Likes”. Go there to find some page suggestions we can select to further specify our audience. Try adding those names as interests but keep in mind not all pages shown here will appear in the “interests” section. In addition to looking at the suggestions AI gives us, use your previous research to further narrow down your audience. For example, you probably looked up different camping brands, magazines, blogs, pages, trails, etc. The more specific, the better. Add these findings to the “interests” section to narrow down your niche even more; for example we’ve added popular hiking spots in the France, ecotourism and other outdoor activities. Once we have enough specific interests in our list, we can remove the first generic interest “camping”. Why? Because by removing generic interests we remove all those people who are not really passionate about camping from our target audience, for example people who liked a generic FB page about “camping” (as they could have done with “dogs”, or “cooking”, or anything else). So, after removing our main generic interest, we get an overall number of 140,000 people. That’s good, since the recommended audience size for selling products in Europe usually around 50,000 to 150,000. Note: for US audiences we’ve seen sellers suggest aiming for an audience size of 200,000 – 400,000 people. Once we are happy with the size and specifications of our niche on AI, we need to save this data to be able to recover it when setting up the actual Facebook ad. To do this, we can click on the “Save” button on the top of the page. Depending on the ad type you choose, you may want to narrow your audience down even more. This next tip will be very useful particularly if you want to address two different niches, e.g. rugby and beer lovers. 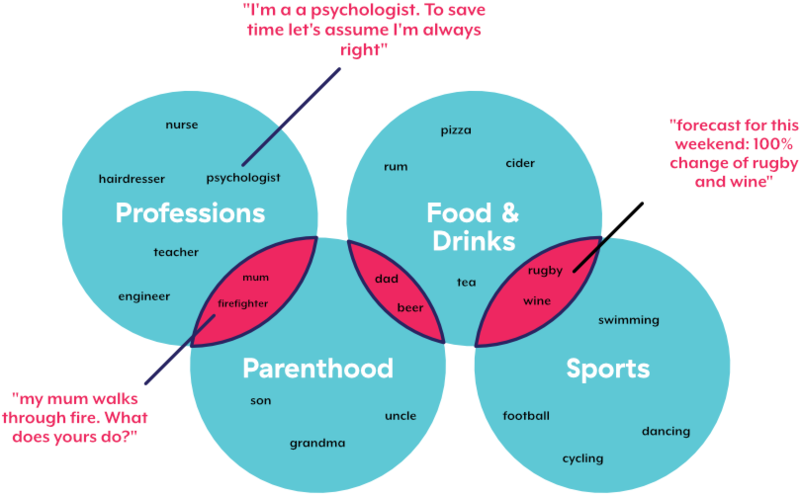 If you only add up the interests ‘beer’ (or rather specific brands, breweries etc.) and ‘rugby’ (ideally certain rugby club names, players, championships etc.) then you might target beer lovers who are not really passionate about rugby or vice versa. When you are ready to set up your ad and you are at the audience settings level of the ad creation process take a closer look at the field ‘Detailed Targeting’. Type in the interests of one of the niches your design is made for, e.g. all beer interests. Add all related interests and then look for the button ‘Narrow Audience’ under the interests you just added. 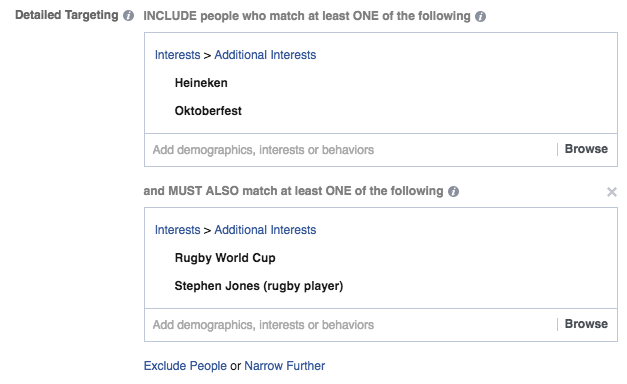 Once you select “Narrow Audience” add the interests of the second niche in the field which appears (in this case all rugby interests). As you add more interests you may notice the audience size on the right-hand side of the screen decreasing. Now the audience you will target must be interested in BOTH, one of the beer interests you listed, AND one of the rugby interests you listed.